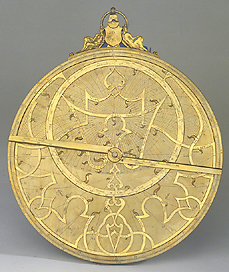 This astrolabe is made up of the mater, which contains eight latitude plates. Seven of these bear different latitudes on both faces, whilst the eighth bears 60? on one face and the tablet of horizons on the other. A shadow square and a quadratum nauticum are engraved on the back of the mater. The figures in bas-relief around the suspension ring, the style of construction, and the nature of the engraving suggest the attribution of this astrolabe to Gualterus Arsenius, an instrument maker in Louvain during the second half of the 16th century.